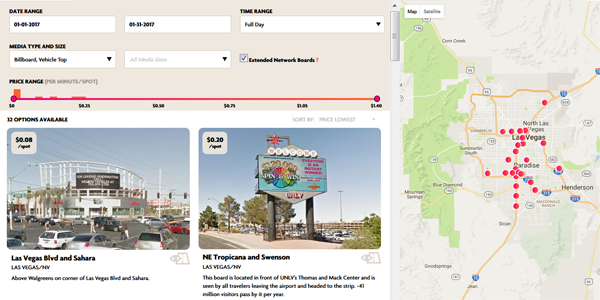 We've built a hassle-free system for you to view real-time pricing and availability on digital billboards. With just one-click you can find and purchase advertising space. Scroll down to view the Search Media bar on the Homepage. Enter a city or zip code. Select a time range. For example, you can choose for your ad to run for a full day or only during peak mornings. You can also select a custom time range. Select a start date and end date for your advertisement. Narrow or broaden your search by changing the radius from your city or zip code (i.e. 5 miles, 10 miles, unlimited). Click on Find Ad Spaces to view results within your search criteria. The search results page will show you all of the digital billboards within your search criteria. Select a board to get real-time availability and pricing. You may use the advanced Price Range sliding bar to filter pricing per ad play. Select the number of ad plays per minute (i.e. 1,2,3) and your total ad spend and ad play number will automatically update. To learn how to book a reservation, checkout the booking a reservation section.